The teachings of Zen came to Japan having significant influences in the country by 13th century and also contributing to the lives of samurai. Based on meditation, practice of Zen is continuously sought upon from people all over the world. The practice of Zen allows us to be in peace even in the fast paced modern world that we live in today. Tea drinking culture also spread through Japan at the same time as part of the Zen practices. 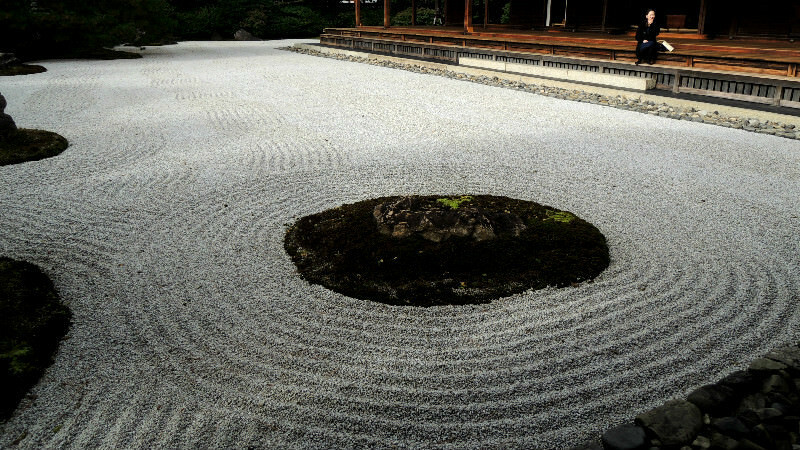 One major development in the world of gardens during the period when Zen became widely practiced in Japan is Karesansui, or dry gardens. Minimalist qualities are displayed using sand and rocks in these types of Gardens. Notice that the patterns differ in each garden heavily depending on the creator. Some rock gardens display calm waves while others replicate stronger waves. Go on and see for yourselves, and find your inner peace. 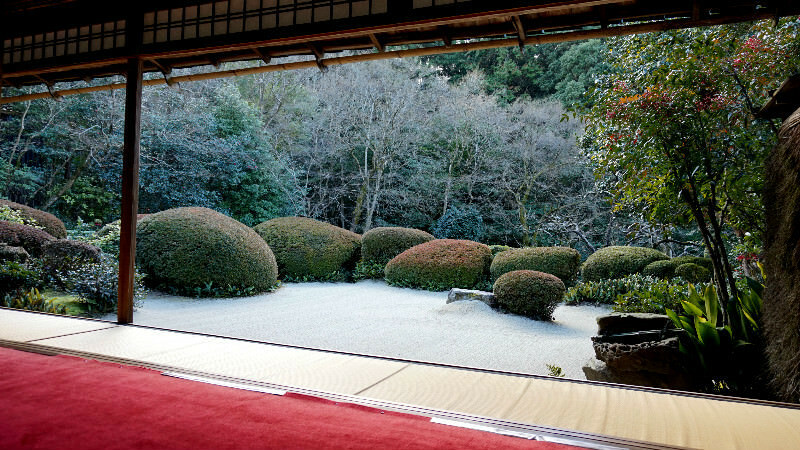 Beautifully maintained garden can be seen from the main building with an open view at Shisen-do Temple. Listen carefully of the sound of bamboo tube hitting the ground from sozu, a system where flowing water weighs down the bamboo hitting the ground periodically. Consider visiting here in the morning, the temple is very calm, quiet, and relaxing. Interestingly, this temple was founded by a Christian feudal lord, Otomo Sorin. Look for the image of a cross in one of the gardens here. Notice the powerful imagery of waves and standing rocks in the dry garden. The largest rock symbolizes Mount Horai from Chinese mythology associated with immortality. The gardens in Zuiho-in Temple were made in 1961 in honor of Otomo by Mirei Shigemori, famous landscape gardener. 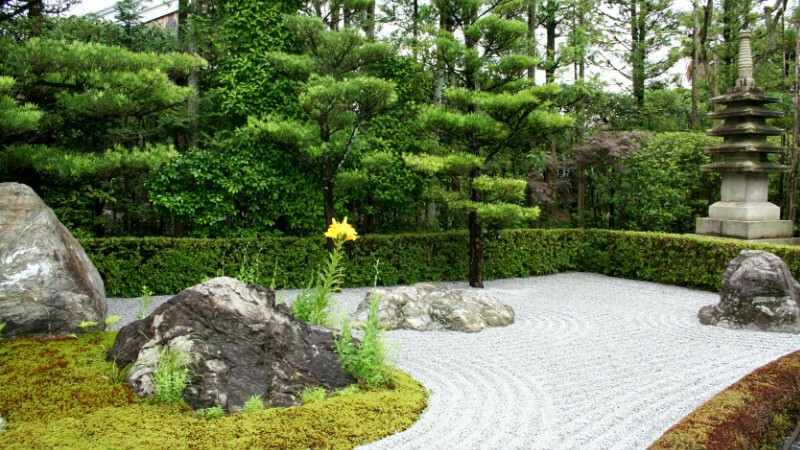 This Zen garden is famous for the 15 rocks placed in the dry garden and is often seen in garden books and magazines world-wide. 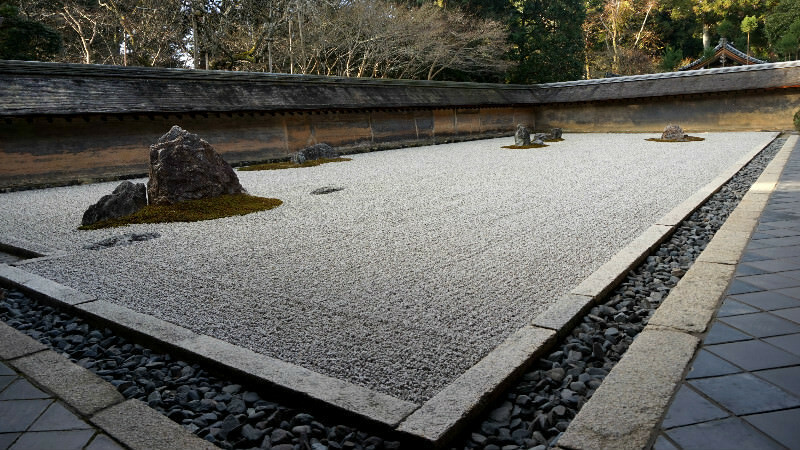 It is said that no matter where you view the garden from, only 14 rocks will be seen. The meaning behind the rock-phenomenon is still a mystery. However, 15 is a number of perfection, and finding only 14 rocks reflect the imperfection towards life. 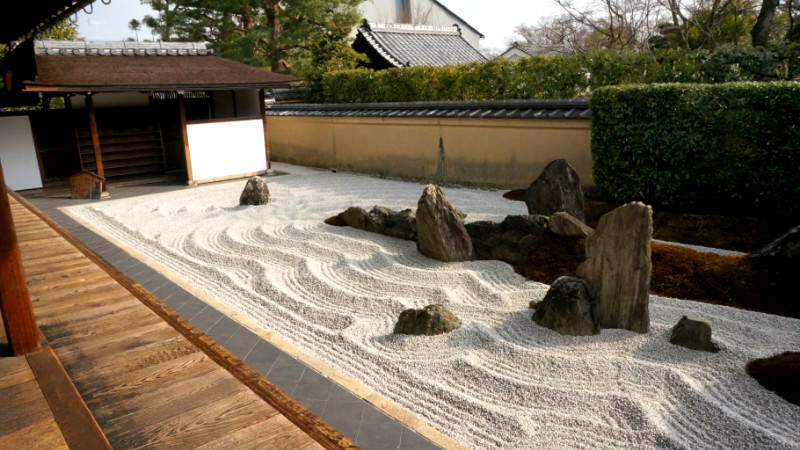 Try for yourself when you visit this garden and see if you could find all 15 rocks. Try to also look for some writing on a rock which some believe to be the names the garden designer, but the fact is still unknown. Kennin-ji was founded by Yosai, a key person who introduced the Zen sect and tea drinking culture to Japan from his travels to China. There are incredible Zen Gardens, structures and ambience here, take a moment to have a seat and appreciate the beautiful patterns of dry gardens. The oldest sub-temple within Myoshin-ji, Taizo-in is a wonderful Zen temple with dry gardens as well as pond garden that are wonderful to walk through or to sit in front of any time of the year to enjoy with some matcha green tea and sweets. The pond garden is fairly new and was made in the 1960’s. By making an appointment, a group of 10 or more can join in for 1 hour of zazen.